Caramoan is home to a hidden paradise, tucked in the tip of Caramoan Peninsula. It boasts of uninhabited volcanic islands with powdery white sands that contrasts itself with rugged limestone rock formations. These islands are ideal respite from the fast moving urban centers. Caramoan is classified as a first-class municipality of Camarines Sur, with a population of 44,945 souls (according to 2010 Census). It is approximately 500 kilometers from Metro Manila and 95 kilometers from Pili, the seat of the provincial government of Camarines Sur. 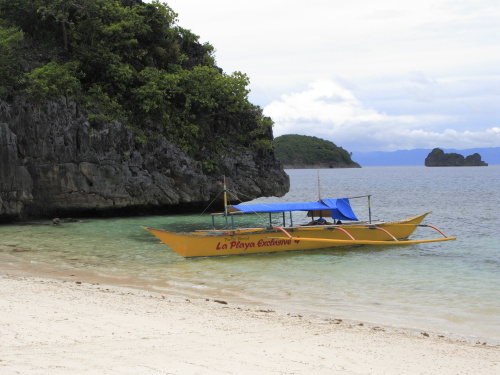 “Caramoan” was officially used since 1619 by a Spanish missionary, Fr. Francisco de la Cruz, who braved to penetrate the dense forests of Caramoan Peninsula to spread the Catholic faith to the natives. But before he came, the place was called Guta de Leche by Dutch traders who operated a gold mine in Lahuy Island. The name was derived from the milkdrop shape of stalagmites found from among the rocks of Guta Port. Story has it that it was later renamed by Spanish conquestadores to “carahan” owing to the numerous sea turtles found in the shores of the Peninsula. Today, Caramoan is more identified by the various editions of “Survivor”, a reality TV show. In my conversations with the locals, they tell me that the place is more alive during production dates of the TV show, and during summer time, where the place is abuzz with local and foreign tourists. It takes a lot of effort to visit Caramoan considering the lack of infrastructure for convenient travel to the place. But for those seeking a rugged, nature, and raw place to go, Caramoan is indeed a place to go. OMG, it’s amazing place. Wish to be there. It remind me Crete. Caramoan will be my next destination!